Dwayne Johnson Announces Robert Ludlum Adaptation!!! 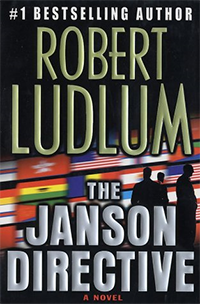 Robert Ludlum is the brain that brought us the Jason Bourne novels that have spawned into an incredibly lucrative film franchise. Even though the writer died in 2001, doesn’t mean that his cannon of work is at rest. Prior to becoming a writer, Ludlum was a U.S. Marine, a theatrical actor and producer. His experience in the theatre is likely what has led his written works to film adaptation so smoothly. He authored some 27 thrillers and although Bourne may be the most well-known of Ludlum’s characters doesn’t mean he was the only one. Enter Paul Janson of ‘The Janson Directive‘. The tome was published posthumously, in 2002, one year after Ludlum’s death. While there may have been a few actors take on the mantle of Jason Bourne, there is one name for Janson. 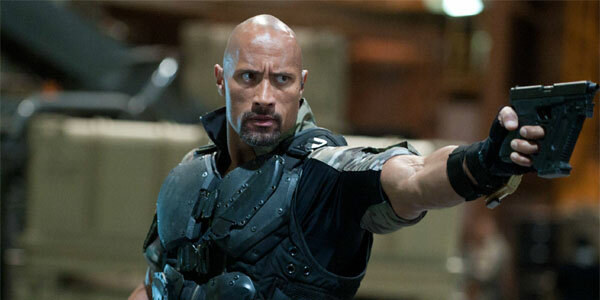 Dwayne Johnson took to Twitter to announce the birth of the project, as all doting parents do, he attached a picture with the news. The former WWE wrestler is perfect for the role of the former Navy Seal who is on a mission to find and save a philanthropist who has been kidnapped. The mission is unsuccessful, conspiracies unfold, he’s on the run after being disavowed by his own agency. Action, intrigue, suspense. It’s all there. 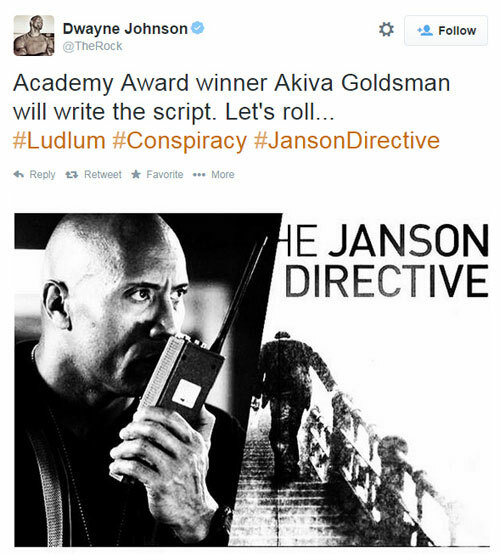 Last June, Universal Pictures purchased rights to ‘The Janson Directive‘. Since then Johnson has been rumored as attached to the piece to star and produce. The Rock went right ahead and told us what he’s cooking up. So we know the project and we know the writer. Academy Award Winner Akiva Goldsman is on tap to write the script. Goldsman has an affluent and prosperous rap sheet that is beyond imposing. Starting in 1994 with adapting John Grisham’s novel ‘The Client‘ then another two years later with ‘A Time to Kill‘. 2001 brought another novel adaptation in ‘A Beautiful Mind‘ that garnered Goldsman his Academy Award, directed by Ron Howard. Goldsman continued his work with Howard with ‘Cinderella Man‘, ‘The Da Vinci Code‘ and ‘Angels & Demons‘. We have a story, a star and a writer currently, but as announcements are made, we will keep you updated. Akiva Goldsman Will Pen Script For Stephen King’s ‘Doctor Sleep’!!! This entry was posted on Tuesday, September 30th, 2014 at 2:13 pm	and is filed under Books, Film, News. You can follow any responses to this entry through the RSS 2.0 feed. You can skip to the end and leave a response. Pinging is currently not allowed. « Hollywood is Remaking ‘Big’!! [whispers to Indiana] I can't forget how wonderful it vas. Thank you. It was rather wonderful. Doctor Schneider. Your car is waiting. [stops kissing Indiana] That's how Austrians say goodbye. Und zis is how ve zay goodbye in Germany, Dr. Jones. I liked the Austrian way better.